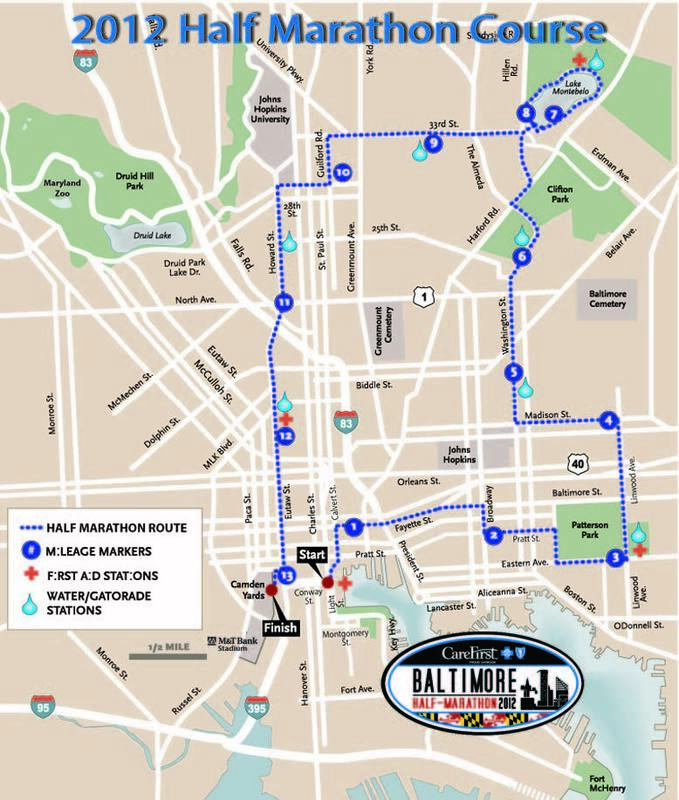 I’m running the Baltimore Half Marathon on Saturday. I’m not going to sugar coat this… I am not as trained as I normally am for a race. I’ve taken my running really seriously since I started, but after finishing the marathon at the end of April, I just haven’t been as motivated. There are a variety of factors in play here. Running in the summer is just harder, and I got really discouraged. I also battled a lot with my migraines this summer. I haven’t really written on the blog about migraines yet but I’ve been getting them since I was about 10. They run in my family and they are hell on earth. I went through a period this summer where I woke up every single day for 2 months with a headache. Not the worst ones I’ve ever had (I had a couple of those too… in bed all day, can’t move, throwing up… it’s really a dream), but enough to throw me totally off for two months. I felt horrible. I gained about 5 lbs too, which sent me into a veritable tailspin. Basically, things were not all that peachy in the land of POTR, and my running took a major hit. BUT I have mercifully gotten my migraines under control again (although I did get a blistering migraine the first night in the new apartment… no fun), I’m no longer eating tons of crap food, and I’m finally getting my groove back. On Sunday, I set out to do 10 miles. I figured if I was gonna run this race, I really needed to see where I was fitness wise to set a realistic plan. Shockingly enough, I did 10 miles in 1 hour 33 minutes. That’s a really decent pace for me and I felt really good. So maybe Baltimore isn’t going to be a total wash for me. I don’t at all expect this to be a PR race, but I think it’s going to be really fun. Since I’m not going for a PR, I thought this was a good race to try running a “smart race”. I didn’t think I ran the smartest race possible in my marathon, and I want to do better this spring at Rock’n’Roll USA. I just read Monica’s post about her Long Beach Marathon PR and it gave me some really great ideas. First, I did what I do best: I researched!! I’ve been studying the course map and elevation chart pretty carefully, which was a major downfall for me in Nashville. I’ve heard from others that Baltimore is a decently hilly course. My legs aren’t in tip top shape, so I’ll need to conserve some energy for the hills. The hill between mile 6 and 7 is clearly going to be the most challenging. Here’s my thinking, keep the pace reasonable for the first five miles (10 min / mile goal) to save my legs for the hill at 6. There are some rolling hills in the first few miles, but I actually do best on rolling hills. They keep me entertained. Then I’ll take the hill in stride. Looking at the elevation gain, I feel like this is a hill I can manage. I run similar sized hills in training often, and while it’s not going to be “easy” it’s doable. Then after I get to the top of the hill, I’m going to pull up a little bit between 7 and 8 to shake out / recover a bit. Once I hit 8, I’m going to empty the tank for the last 5 miles. There will be a slight incline again around mile 9 but it won’t be as bad as the last hill. With all the downhill at the end of the race, I’m going to just try and push as intelligently as possible. I’ve been pushing myself a lot recently in my runs to that “comfortably hard” place, and I know I can absolutely do that for 5 miles. Thoughts?? Anyone run Baltimore before?? Great thoughts on running a smart race. I’m running the Rock ‘n’ Roll 10K in Brookyln, NY this coming Saturday and need to do a bit of research too! Good luck on your half, you will do great! Good luck to you on Saturday!! I have yet to race in NYC. Definitely on my list 🙂 Thanks for reading! Good luck this weekend! I love that you think hills are entertaining! But if you’ve trained on them at all, you should be fine. Thank you 🙂 I think hills lets me set like mini-goals which makes the race seem shorter!